I can’t believe it, 2006 is almost over. This is a time when we all reflect on the past year, our triumphs, our sorrows, our life. It is time to take an inventory of our lives, to look at where we have been, where we are now, and where we want to go. Knitting marks our passage through time. Every item we knit reflects who we are. It is tangible evidence of who we were, where we were, and what we were doing at that particular point in life. I look at my oldest knitted artifact–a pair of mittens knitted for my dad. They are made of ragg wool, grey and black, with a cable running down the top. I knitted at least 3 mittens before I finally got one that was small enough to fit. I thought I had to follow the directions exactly as written, including needle size. I didn’t know that it was OK to take a detour from the written instructions. I knew what the finished product was supposed to look like, but the path that was laid out in the instructions didn’t take me there. I had to forge ahead with my own ideas. After a couple of attempts, I found out that it was OK to think independently from the pattern, to meld your own ideas with those of the designer. So it goes with life. The route we plan to take frequently takes a detour, yet our ultimate destination stays the same. As Brenda Dayne says in her “Knitter’s Manifesto”, knitting becomes a living record of who we were when we began, how we changed along the way, and a record of who we are at completion. Bertha and I were talking about things we have knitted over the past year. I wrote down her completed projects, but I left the notes at home. This is Christmas Eve and I am at my mom’s in Roll. Best as I can remember, she knitted at least 4 prayer shawls by herself, and joined in to knit at least 3 others. She knitted at least 2 drop stitch shawls, no–make that 4. She has two, and she knitted 2 for her mother in law, both in different shades of yellow. Add to that scarves that are too numerous to mention and 4 or 5 scarchos for nieces and Sarah. When you stop to think about everything you have knitted over the past year, you will be amazed. Linda knitted these fingerless glove/handwarmers in a flash. 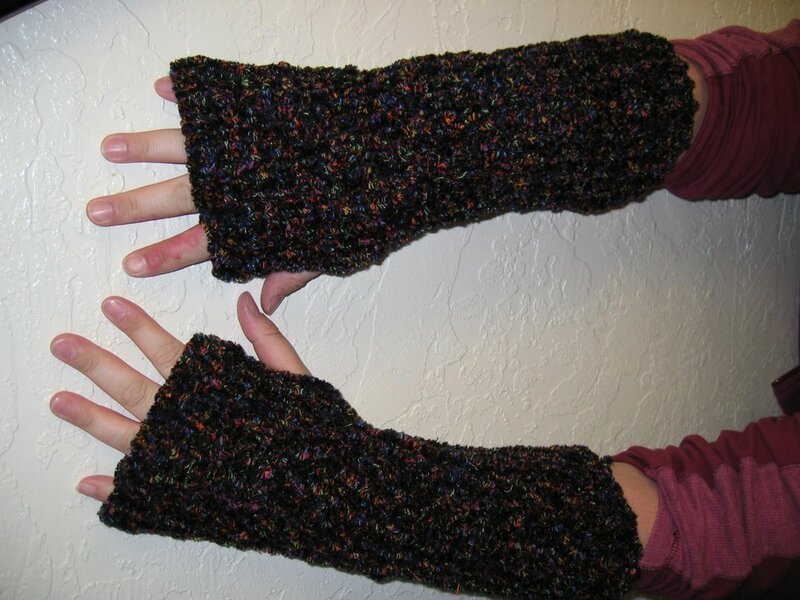 She knitted them in chenille, on a large-ish needle (11? ), around 20 stitches, knitted a rectangle, then bound off, seaming them, leaving a hole for the thumb. Quick and comfy. A couple of new things I read about–Denise needles have a breast cancer set that costs $55, comes in a pink case with pink cables. The $5 goes to research. Also, they now have size 17 and 19 needles. I hope Santa took the hint I left for these. 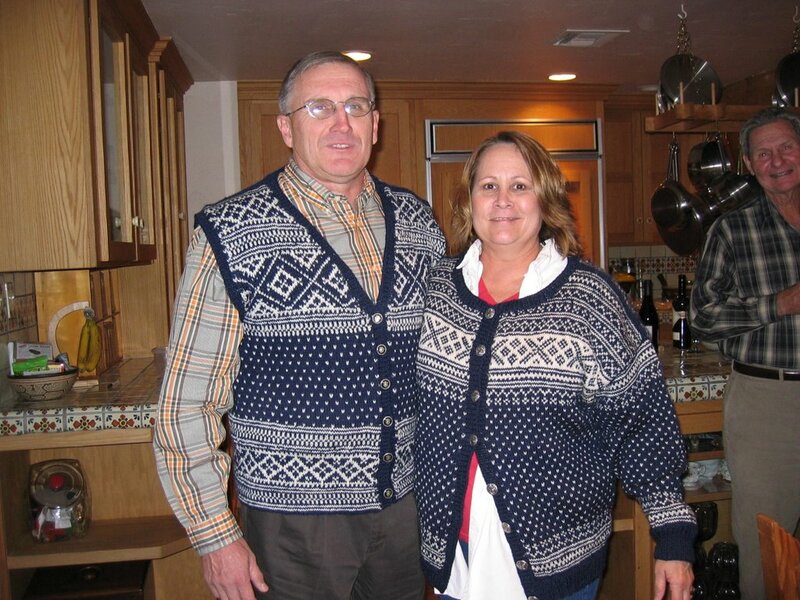 And last but not least, the Sven and Olga Sweaters. Enjoy the photo, we don’t wear them often. Especially not with the shirt that Curt has on. My New Year’s resolution is to leave the chubby cheeks and blubbery neck behind in 2007. But right now I have to go get a slice of Italian Creme Cake. New Year’s is still a week away. I wish you all a Merry Christmas and Happy New Year. May you surround yourself with beautiful knitted things and people who love you. And Cashmere.